Also hard to find on audio. I find Steve's voice to be fascinating, and even before I knew him, I was fascinated by listening to him speak his own work. The War of Art is one of those books, at least for me when I finally was exposed to it, I said, 'Why wasn't I informed? Why did it take this long for this book to land on my desk?'... You need to be clear with yourself about what you are afraid of, why you are afraid, and whether you care enough to dance with that fear because it will never go away. There was a moment where I was on a quest for self-discovery. I felt lost and wasn't sure if I was who I was because I made the decision to be me, or if my identity was programmed by culture, society and setting. Because of that, I started reading self-help books to reconstruct identity and mold who I wanted to be. This book helped me. When a writer or an entrepreneur, or a manager, or an employee, or a…whatever…sits down to get to work, he or she is often met by “the resistance”. The excuses that come up: I can’t do this. I am too old. I don’t have enough money. I’m scared. “The War of Art” is the guide to getting through that block. The comfort zone is papered up and cemented shut by our excuses. Learn to blast through that wall. Because on the other side of the comfort zone are all the tools of success. I'd recommend a sprinkling of business books followed by a heap of productivity and behavioural psychology books. The business books will help you with principals and the psychological books help with everything else in your life. Building your own business can really [email protected]# you up psychologically. I love this book. It simply lays out the difference between the true artist and the amateur. It is so inspiring and makes you understand see if you are doing something because of a real passion or just passing the time. It also makes you realize that true success is never an accident. I immediately thought of The War of Art by Steven Pressfield. It was pivotal for me as an artist, a creative, and an entrepreneur, but it's not just for artists. It's a book about fear and how we limit ourselves. This book helped me unlock my Resistance to perceived risk in business and in my career in a way nothing else had. The book introduces, among other things, the idea of 'Resistance', an oppositional force at war with human endeavor and ingenuity, a kind of near-demonic energy that 'resists' creative yield. Now, I know that sounds like 'new age' baloney and semi-spiritual psychobabble, but the War of Art is anything but vague and whimsical. It is a hard-hitting, take-no-prisoners treatise on the universal challenge of creation. It is tremendously, gloriously encouraging — it illustrates how the struggle to create, to grow, to seek discipline and rigor and progress, are fundamentally human challenges. It shines a light into the darkness of creative dearth; it puts into words the unspoken struggles of millions of artists. It was first published in 2002, and you only have to read its testimonies to understand its impact. War of Art is all about working through your own resistance and journey as an artist and creator in the world. It gave me permission to create and believe in my gifts in a way I hadn't before. 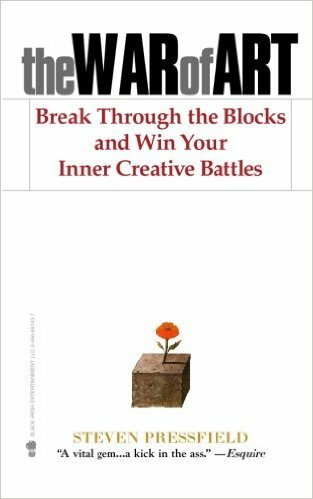 Bestselling novelist Steven Pressfield identifies the enemy that every one of us must face, outlines a battle plan to conquer this internal foe, then pinpoints just how to achieve the greatest success. The War of Art emphasizes the resolve needed to recognize and overcome the obstacles of ambition and then effectively shows how to reach the highest level of creative discipline. Think of it as tough love . . . for yourself. Whether an artist, writer or business person, this simple, personal, and no-nonsense book will inspire you to seize the potential of your life.